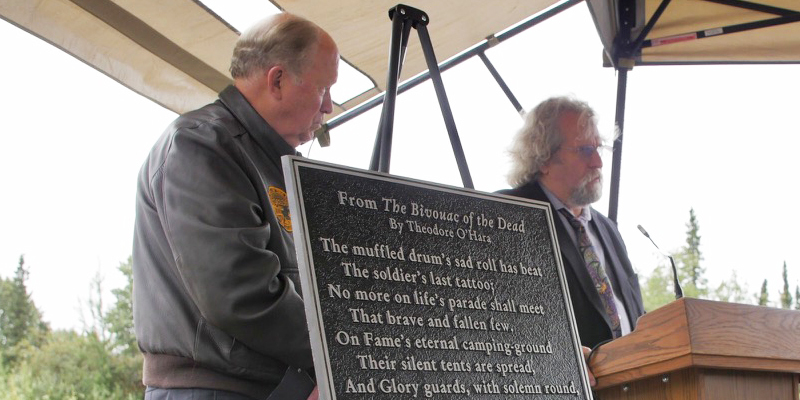 Fairbanks – A ceremony formally announcing the site chosen for the Fairbanks Veterans Cemetery was held Wednesday at the site located at mile 344 of the Parks Highway. State Representative David Guttenberg (D-Fairbanks) has championed the development of a Fairbanks veterans cemetery for many years and has been instrumental in its development. During Wednesday’s ceremony, Rep. Guttenberg spoke of the importance of allowing interior Alaska veterans to be buried in their home area. 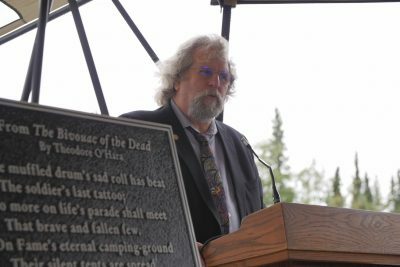 Rep. Guttenberg first started working on the Fairbanks Veterans Cemetery project after the death of Rick Roethler, who was a Marine Corps veteran and a dispatcher at the Laborers Union Local 942 in Fairbanks. In 1974, Roethler dispatched Rep. Guttenberg out of the local union hall. After his death, Roethler’s widow informed Rep. Guttenberg that Roethler and many other interior area veterans wanted a veterans’ cemetery for the Fairbanks area. Construction of the proposed Fairbanks Veterans Cemetery is scheduled to begin in 2020 at a site near mile 344 of the Parks Highway. The State of Alaska is working with the U.S. Department of Veterans Affairs to secure grant funding for the project through the National Cemetery Administration. For more information, please contact Alliana Salanguit in Rep. Guttenberg’s office at (907) 456-8172. ← Fairbanks Back-to-School Tips & Resources! Address: Room 501 Capitol Bldg.